What we currently refer to as the Nevada-California-Oregon Railway (NCO) was, in fact, a very confused, many-named, underfunded and contrary undertaking. 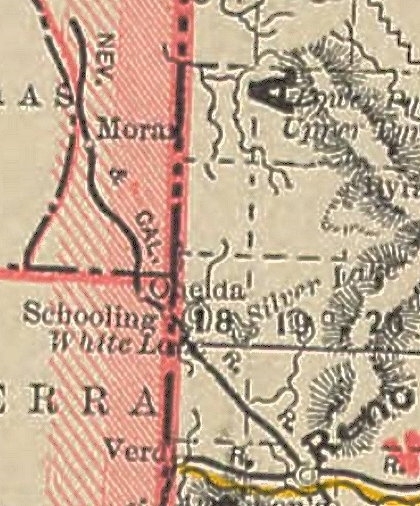 On current maps, it is shown the railroad ran north from Reno, NV to Lakeview, OR. However, it was originally envisioned as running SOUTH from Wadsworth, NV towards the mining camps of Belmont, Ellsworth, Grantsville, Candelaria, and Belleville. John T. Davis, an entrepreneur from San Francisco, began exploring the possibilities of constructing a rail line to serve these areas. He formed the Western Nevada Railroad Company (WNR) in December 1879 to initially build 55 miles south to Walker Lake. In February 1880 he travelled to New York to seek funding. There he met Frank F. Fowler a capitalist, who further introduced him to Col. Thomas Moore, a railroad contractor. After hammering out a preliminary agreement, Moore and John C. McTarnahan, a wood man and surveyor, made a trip out west to examine the proposed route. Also in February 1880, the Nevada State Journal (NSJ) had an editorial article discussing the recent introduction of a bill in the California Legislature to protect the remaining timber around Lake Tahoe. The editorial surmised that the timber required for the various interests in Nevada would require a railroad to be built from Reno to “the great timber belt near Susanville.” However, in the same issue there was another article that said there was a group of entrepreneurs that were considering building a railroad north to Sierra Valley staring from Truckee. Darius O. Mills, president of the Virginia & Truckee Railroad (V&T), for some time had been considering a possible extension to the south, but had held off. When he learned of the plans of the WNR, he decided it was time. He incorporated the Carson & Colorado Railroad Company (C&C) to build a three foot narrow gauge track from the V&T station at Mound House, NV on the Carson River (10 miles east of Carson City) to Ft. Mojave on the Colorado River. Preliminary surveys had already been conducted prior to the incorporation of the C&C. Initial plans were to run in a southerly route to the north end of Walker Lake. 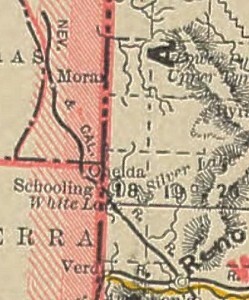 In addition, there was another railroad, the Nevada-Arizona, planning to build in the same general area. Col. Moore, upon hearing of the other planned roads, went to Reno and had meetings with several businessmen to discuss the feasibility of using Reno as a starting point. Despite the fact that Reno was in terrible shape due to the 1879 fire which had destroyed most of the business district and the mines in Virginia City were faltering, the Reno businessmen were hopeful a new railroad would bolster the local economy. Satisfied that Reno would be a better starting point, he returned to New York to talk to Davis. 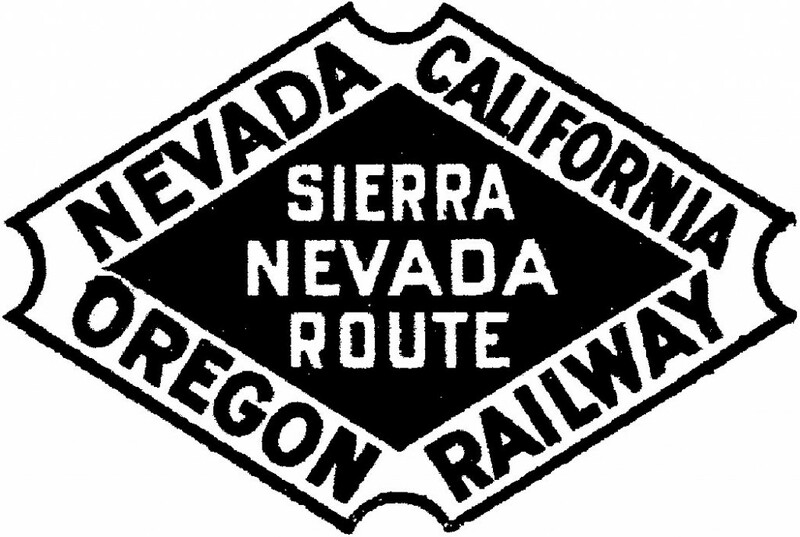 Davis agreed, abandoned his original plans and incorporated The Nevada & Oregon Railroad Company (N&O) to build south to Aurora, NV and north to the California-Oregon line. Two survey teams immediately set out in opposite directions. Davis, with McTarnahan as a guide, headed south. A. J. Hatch, Nevada Surveyor General was hired to begin the survey north. At a board meeting in Carson City in August 1880, the decision was made to start building south first from Reno to Carson City, apparently to compete with the V&T, then proceed south eventually to Bodie. An agreement was drawn up with Moore as construction supervisor to begin as soon as stock subscriptions had raised sufficient funds. Construction going north to Beckwourth Pass would not be started until Carson City had been reached. John Davis was furious! He refused to sign the agreement and resigned as President, returning to San Francisco. General A. J. Hatch assumed the presidency and signed the agreement. Since Reno was still reeling from the 1879 fire, stock subscriptions were very slow to come and could not even begin to approach the $250,000 required for the initial construction south. As early as May 1880, rumors began that the south line would not be built and the 31 mile track to Beckwourth Pass would be the initial goal. In early December, Col. Moore announced that as soon as $100,000 in stock subscriptions were realized, work would start. On December 22 amidst much pomp and circumstance, ground was broken. A contract had been signed with H. L. W. Knox for grading of the first three miles and another contract was made with John Sturgeon for the necessary trestle work. Moore immediately left for New York to attempt to raise more money. On February 21, 1881 Knox stopped all work and filed a lien for $5,328. His contract stipulated that he would be paid the first settlement on February 20, but neither Moore nor any money was available. Local stock subscriptions from Reno were only $400. President Hatch, who had advanced $14,000 of his own money in December to keep the work going, was reluctant to put up his home. On March 4, the Reno Evening Gazette (REG) reported that all work had stopped and the company was going to end the contract with Moore if he did not return very soon. On April 7, Moore arrived and in an interview with a reporter from the NSJ he announced that he had ordered $90,000 worth of rails and had $250,000 in the bank to get the work well underway. The plan was to mortgage the railroad five miles at a time to keep money coming in. About this time, a group of local businessmen decided to form another company to take over the building of the railroad if the N&O collapsed as they felt the N&O was not well organized and would probably never get the railroad built. On April 25, Moore’s friends organized a new company named simply Nevada & Oregon Railroad (Omitting “The”), hence creating a new company with essentially all of the same principals still in control. That same morning, the directors of the old company met and signed over all of the books to the new company. Knox immediately put his crew back to work. The workforce at this time was composed of 240 men including 80 Chinese. The first spike was finally driven at 2:30 pm April 28, 1881. It was reported that a large amount of iron, spikes and ties were on hand. The first locomotive was scheduled to reach Reno by June 10th. The first seven miles of track were completed by June 24. Taking two months to lay only seven miles of track does not qualify as a ‘blistering pace of advance.’ Col. Moore had gone back to New York, returning in July. There was a bit of difficulty from the Chinese including a strike over wages, but it was soon settled. With 430 men at work on the railroad, the tracks had finally reached the ten mile mark by August 1. The promised new locomotive still had not arrived. Finally in early August five narrow gauge flat cars (purchased second-hand from the Lake Tahoe Railroad) along with a second hand locomotive, the SANTA CRUZ, was delivered. By early September, the ten mile mark had been reached and some 21 miles of grading were completed. On the surface, things began to look up, however, there was a dissatisfaction of Moore by the Board of Directors. None of them had received reimbursements for the advances they had made and there was no accounting for the funds Moore had received. Frank Fowler, who had introduced Moore to Davis back in 1880, came out to check on things. He was shocked to discover after five months of operation the new company had never written any by-laws to determine the terms in office of the directors. On September 12, he and Moore scheduled a stockholders meeting for September 27 to elect a new board of directors. A portion of the existing board, consisting of E. D. Wheeler, T. Coffin, James Meacham and John Sunderland, had no desire to be replaced and in a hasty Board meeting on September 15, they voted themselves 12,500 shares of stock each without being required to pay anything for it. Moore realized it was an attempt to control the upcoming stockholders meeting. Moore sought and received an injunction in court which forbade the directors from transferring any stock or other property and further stated they could not vote any shares at the upcoming stockholders meeting other than shares they had previously purchased. At the stockholders meeting on September 27, the Wheeler faction showed up along with some laborers who were asking for their pay. The meeting was called to order at 1:00 pm and Moore stated that Wheeler, Coffin, Meacham and Sunderland were not stockholders and were to be removed. It is not clear exactly what happened other than several people pulled out guns ad eight shots were fired during the scuffle. Two persons were hit, stockholder David Balch and Company Secretary S. C. Scoville. Both were immediately evacuated. It was not expected that either man would survive. Balch eventually recovered, but Scoville died. Strangely enough, no one was ever charged with the shootings. After the shooting, the meeting went on and a new board was elected. On November 26, an inspection excursion on the completed 15 miles was conducted for large party of ladies and gentlemen. The train consisted of the locomotive Santa Cruz, two flat cars and one boxcar. The train carried rails, water and the excursionists. All were amazed and pleased with the trip. Despite the success of the trip, there was much discord at home. Creditors were demanding payment and there was no money in the till. Moore had made no accountings of the money he had received nor how they had been spent. Moore threw in the towel, broke his contract and went east for the last time. All work ceased on December 1. To satisfy as much of the outstanding debt possible, a sale was held on February 1882 of all the assets of Thomas Moore which included all of the lumber, ties, rolling stock, tools and 2,725 shares of stock. Directors Manning & Barry bought the locomotive, rolling stock and tools. They then leased them back to the company for $10 a day. Director C.A. Bragg bought the lumber, ties and timber. Director McMurray bought the stock shares. Fowler and Balch went to New York to attempt to arrange more financing. On March 11, 1882 the NSJ reported that Balch had sent a telegraph indicating the N&O would be able to push ahead with construction and that Moore was no longer associated with the railroad. By August the tracks had been completed a total of 25 miles north. A new engine plus freight and passenger cars were ordered. As is quite evident, the schedule was not tightly adhered to. On one occasion, several minutes after the train had left the Reno station, it stopped and backed up to the station to pick up a missing passenger that had overslept. These vagaries and others resulted in declining revenue and on January 29, 1883, the last trains were run and the train was shut down. In late April, there were rumors that the railroad might start up again, as the NSJ reported 35 applications had been received for the job of Conductor, but not General Supervisor nor Treasurer of the company. Jerry Schooling, a local dealer in housewares and groceries, wanted the train opearating to be able to ship lumber from his mill in Long Valley. A deal was made to lease the railroad to Judge Webster who in turn turned operations over to Schooling. Schooling ran a minimum of two round trips per day and an occasional chartered outing. On September 3, W. L. Berry, a former partner in another grocery and hardware business, took over operation of the railroad. Operations continued to and through the winter. However the heavy snows caused serious trouble when the engine got bogged down causing a two week delay in trips. To be continued next Headlight. Who Was Honest John Sparks?